Conspiracy theorist Alex Jones got a cameo. The first charges have been filed against three people in Special Counsel Robert Mueller’s Russia interference investigation, including two men involved with Donald Trump’s election campaign. Former campaign chairman Paul Manafort and his business partner, Richard Gates, have been charged with conspiracy against the US, conspiracy to launder money, and other charges. They both pleaded not guilty Monday. During its coverage of the news, Russian state-funded media outlets unanimously pointed the finger at Ukraine. Manafort and Gates worked for the Ukrainian government, and allegedly laundered millions of dollars they made in the process. Kremlin-funded news outlet RT led its coverage of the scandal by highlighting Ukraine's role. Both the online articles and news bulletins on its television channel claimed “there is no Russia connection in the indictment,” but that's not accurate. Manafort and Gates both worked on the campaign of Victor Yanukovych, who became president of Ukraine in 2010 and then was ousted by nationwide protests in 2014. The protests, dubbed the Maidan Revolution, were sparked by Yanukovych's pro-Russia stance. The ousted president backed away from a pro-European pact, a move that was widely viewed by protesters as bending to Russia's demands. After being ousted during the deadly uprising, Yanukovych fled to Russia. The success of that uprising is what eventually led to Russia annexing Crimea and starting a proxy war in eastern Ukraine. Some of this context was mentioned in the indictment, but it was largely absent from Russian state media coverage. “The association with Manafort was spun in the media as evidence of Trump campaign’s collusion with the Russian government,” RT reported, omitting the details of Yanukovych's political dealings. 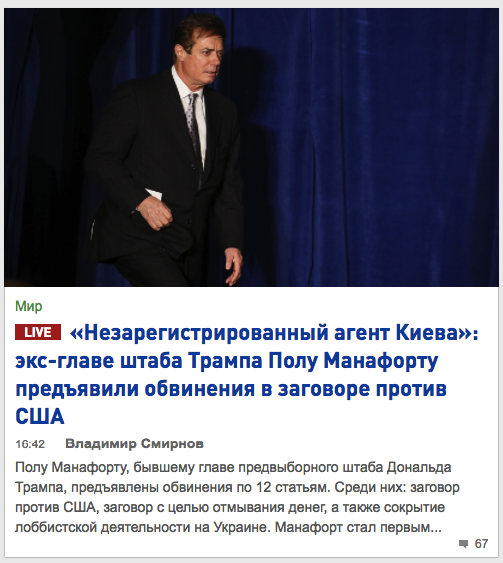 “Unregistered agent of Kyiv”: former head of Trump campaign Paul Manafort blamed for conspiracy against USA, the Russian RT headline says. Russian-language state television Rossiya 1 opened their talk show, 60 minutes, with a video of Alex Jones pledging allegiance to Putin. Russian state television started out toeing a similar line, saying, “They were looking for a Russian trace but found a Ukrainian one,” about the charges. The show featured Russian Foreign Ministry spokeswoman Maria Zakharova, who dismissed the contents of the indictment without mentioning what they are. “You showed a clip of the circus that’s happening around us,” she said after the Alex Jones video. Part of the program was dedicated to a CNN chart that showed Manafort’s possible paths to Putin. Zakharova called the chart a classic PR campaign. “If we believe this chart, it means that Russia is responsible for what was stolen in Ukraine,” she said. An error in the indictment papers is being used by Russian media as evidence it’s not reliable. The Manafort and Gates indictment falsely claimed Ukrainian politician Yulia Tymoshenko was the president of Ukraine. 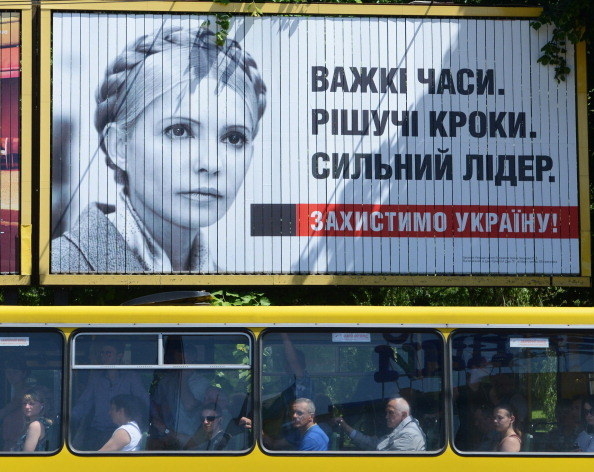 Tymoshenko never held the position, she was instead prime minister between 2007 and 2010. The Rossiya 1 show used the mistake to argue the indictment documents are unreliable. “If you’re talking about a serious document, these things don’t happen,” Zakharova said. A Russian wire service quickly picked up the tidbit, which was then reported on by RT and other outlets. By Tuesday morning, RT was no longer putting the indictment story at the top of its homepage.